THERE'S a basketful of chickens squawking, a cat meowing, and I feel like I'm on the verge of a nervous breakdown. Chef Heinz von Holzen is standing in front of our group of 10, "hypnotising" a chicken he's named Charlie, and I'm convinced he's going to kill it, here in front of us, in the middle of this busy Balinese market. (It doesn't help that I'm terrified of birds). The horror must be showing all over my face: Von Holzen growls at me to stop looking so angry. It's the first of several scoldings of the day. We are at the bustling Jimbaran vegetable market, the first stop on Von Holzen's day-long Bumbu Bali cooking class, where chickens, cats and scooters exist alongside tightly packed stalls offering everything from bras to bananas to readymade palm leaf baskets for the canang sari, daily offerings that are scattered everywhere in Bali. Balinese markets like these are controlled, explains Von Holzen, by ladies, whether they're sellers or buyers. With no refrigeration for easy storage, "Mama Bali", as he calls her, visits markets like these early each morning for fresh produce, and to catch up on the latest gossip. Like most things in Bali it's a mad sensory overload of the beautiful and confronting: colourful baskets full of tiny chillies and other spices, fruit and vegetables, bowls of prawns buzzing with flies, piles of raw meat, bags filled with dazzling exotic looking flowers, and an endless parade of scooters whizzing past. After a tour of the market - and after Charlie the chicken is put back into the basket to live another day - we trundle into minivans and head to the traditional seaside fish market down the road. If the earlier market was controlled by women, here, it seems to be the domain of the men. Jukung, traditional fishing boats, line the beach, while inside the market the roof is disorientatingly low with sand-packed bags for a floor. As he guides us around, Von Holzen talks of his devastation at the collapse of the fish population here, explaining that most of the fish we see in the market is frozen and shipped over from Java rather than caught fresh in Bali waters. Much of the seafood here is frozen or defrosting, and he points at the cloudy eyes of most of the fish to prove his point. We head back to Von Holzen's sprawling Pasar Malam compound, with its traditional guest rooms and open air pavilions and kitchens. Over a quick breakfast of Balinese fruit, black rice pudding and deliciously decadent sweet rice flour dumplings covered in palm sugar coconut sauce, Von Holzen tells us about his background. The Swiss-born chef, who moved to Bali several years ago after being offered the job of executive chef at the Grand Hyatt, has made it his life's mission to champion the undervalued Balinese cuisine, with his own Bumbu Bali restaurants, books and cooking classes. 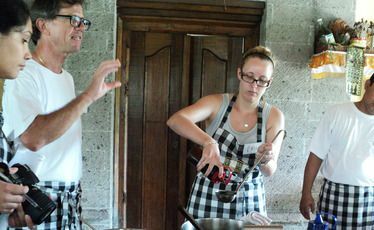 There are countless cooking schools in Bali but I suspect none have the personality and entertainment value of this one. Von Holzen is a demanding host, passionately rattling off quotes and scientific facts from his favourite chef Heston Blumenthal and food writer Harold McGee, and barking questions at us that elicit awkward responses of what is generally the "wrong" answer (How many times to turn a steak? Why do we season water with salt? What came first, the chicken or the egg?). These faux scoldings are offset by the comedy routine between Von Holzen and his long-time assistant Pak Bagus, a hilarious man with an expressive face. The pair banter back and forth, teasing each other and their guests. It's almost like dinner theatre (Although I discover later, after reading a few others' experiences online, that much of this is scripted - even Charlie the chicken is a recurring character in this production). The cooking class itself is held in one of the large open air kitchens, where we are greeted by colourful bowls of pre-cut chillies, garlic, shallots, ginger and more (Von Holzen won't allow guests to chop anything). It is a long, but productive day: meeting at the market at 6am, followed by a relentless cooking schedule preparing around 20 authentic Balinese dishes, from the nasi kuning - yellow rice - rice is the most important element of a meal for Balinese - to urab jagung (sweet corn with grated coconut; one of the best things I have ever tasted), to the final dish, nasi goreng - which Von Holzen is at pains to remind us, is not actually a traditional Balinese dish. Each guest is expected to contribute - my dish was the tum ayam, or minced chicken in banana leaf - and after about five hours of grinding, steaming, boiling, sauteing and simmering, we sit down to enjoy our feast - and it is delicious; fresh, fragrant and full of spice. I may not quite be a master of Balinese cooking, but Von Holzen's passion and class have certainly boosted my appreciation for the island's unique cuisine - and shown me there's much more to Bali than shopping, sunset bars and yoga.